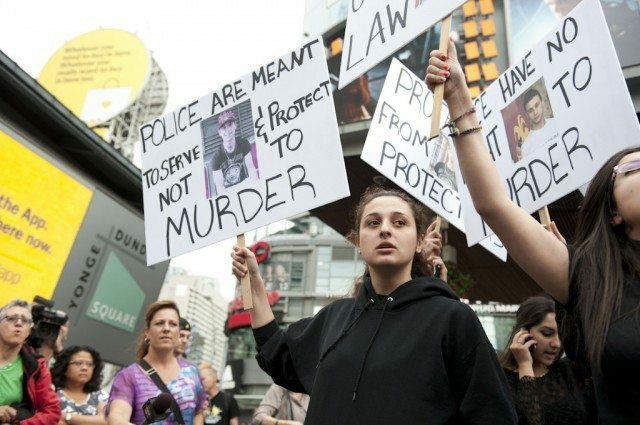 Sammy Yatim’s sister Sarah stands with protesters at Yonge-Dundas Square at a rally held three days after he was killed. At the beginning of today’s Toronto Police Service Board meeting the Board’s chair, Alok Mukherjee, read a statement regarding the police shooting of Sammy Yatim. Mukherjee has been publicly vocal about the case, saying that police may well benefit from better training when it comes to de-escalating conflicts in cases like Yatim’s: the 18-year-old was shot while alone on a streetcar while displaying a knife. Many, both on the scene and in the city more broadly, have expressed outrage that what seems to have been a somewhat contained situation ended in Yatim’s death. Several investigations have been launched in the wake of the shooting: the Toronto Police Service is conducting an internal review of its policies, the Special Investigations Unit is examining whether the officer who shot Yatim acted improperly, and Ontario ombudsman André Marin is looking at how police are trained to de-escalate conflict situations in the province. I would like to make some comments on behalf of the Toronto Police Services Board regarding the tragic death of Mr. Sammy Yatim on July 26. We share the pain of the Yatim family, and once again, express our condolences over the tragic death of a young person. The Board also fully recognizes that Sammy’s death and the circumstances surrounding it have given rise to many questions and concerns in the community. We share many of these. We wish to understand how this death could occur and to be ensured that appropriate action is taken to deal with it. At the same time, we are also committed very strongly to doing everything within our authority so that the risk of another such tragedy happening is greatly reduced and effective systems of accountability are in place. To this end, the Board has taken a number of steps already. First, on July 30, the Board communicated to Chief Blair in writing its expectation that his review of the policies, procedures, training and individual conduct will be very thorough and comprehensive. Second, in its public statement of the same date, the Board called on the Special Investigation Unit or SIU to conduct a full investigation and to complete it as expeditiously as possible. As well, it asked Chief Blair in writing to take all steps to ensure that all police officers involved in the tragic occurrence, whether subject or witness officers, will cooperate fully with the SIU investigation. Third, we are the only Board that has publicly supported the systemic exercise that the Provincial Ombudsman, Mr. André Marin, has announced into the provincial standards and requirements with respect to use of force and de-escalation techniques by Ontario’s police services. The Board will cooperate with this review. Fourth, due to the exceptional circumstances regarding this incident and the timing of the upcoming inquest, the Board has decided today that it will seek independent legal standing at the forthcoming inquest into the deaths of Mr. Jardine-Douglas, Ms. Klibingaitis and Mr Eligon. We believe that this is an extremely significant inquest, and wish to be able to separately probe issues such as training, de-escalation, supervision and accountability involved in police interactions with people experiencing mental health issues. The Police Services Act imposes certain legal constraints on our ability to ensure accountability. We find that it hampers our ability to exercise the oversight that the public expects. The actions on the part of the Board that we have just mentioned go well beyond what is usually done at this stage in the handling of a death from policing shooting. We are determined to push the boundaries of those legal requirements by calling for strong and immediate action by those who have statutory responsibility. We are also committed to taking necessary measures to ensure accountability once the results of the investigations and reviews are available to us. We take an extremely serious view of the incident and are prepared to use every power and authority that the Board has to deal with it. As many of you know, police interaction with people experiencing mental health issues is of the greatest concern to the Board. This is why the Board has established a permanent Mental Health Sub-Committee. We are grateful for the readiness with which so many knowledgeable members of the community, including consumers/survivors and representatives of a whole host of mental health providers, have come forward to assist us in finding the right approaches to respond to calls for service. The Toronto Police Service has fully cooperated in the work of this sub-committee. And we believe there have been good changes as a result. Clearly and sadly, our work is far from over and even one death is one too many. The Board accepts that our goal should be to prevent deaths, to the maximum extent possible. Therefore, the Board will look to the sub-committee to broaden its scope of work. Specifically, the Board will extend full support to the sub-committee engaging in a broad-based, independent community consultation to elicit concerns, issues and experiences as well as ideas and advice with respect to further strengthening policies, programs and systems of accountability. Yesterday, Chief Blair announced that Honourable Dennis O’Connor former Associate Chief Justice of Ontario as well as a jurist well known and respected for his independence, integrity and strong track record of inquiring into tough issues, has agreed to undertake a review of policies, procedures, training and equipment involved in interactions with persons with mental-health issues. This review is required by law and its results are reported to the Board by the Chief. As I said before, the board has asked the Chief to ensure that this review is thorough and comprehensive. We welcome the appointment of Justice O’Connor as the reviewer and look forward to his report. For its part, the Board is committed to making the report public in the interest of transparency and accountability. We very much hope that Justice O’Connor will look at systemic issues in the light of prior incidents. This review is one of two processes that take place whenever there is serious injury or death due to police interaction. The other process is the SIU investigation to determine if there was a breach of the Criminal Code such that criminal charges should be laid. The law requires that there be no public comment on or discussion of the specifics of the occurrence under investigation until the SIU investigation and the Chief’s review are completed. This restriction applies to all of us, including the Board. As such, the Board will make no comment in the circumstances or individuals involved in the death of Sammy Yatim. Nor will the Board express any opinion at this point. Law requires the Board to wait for the completion of the investigation and the review. Let me say, however, that while the Board will respect and uphold the law, it will remain actively involved in efforts to improve policing services to people with mental illness, to do everything in its power to find ways that prevent death, and to ensure that there are effective and meaningful systems of supervision and accountability. The Board shares the community’s determination that Sammy Yatim’s death should not be in vain. The inquest mentioned in Mukherjee’s statement pertains to three separate deaths—all cases in which the victim had an “edged weapon” and was shot by police—which will be investigated together at an inquest beginning October 15. Reyal Jardine-Douglas, age 25, was shot and killed by a Toronto police officer on Aug. 29, 2010 after he fled from a TTC bus; his family had called 911 earlier in the day to say he was in distress. Sylvia Klibingaitis was shot and killed in front of her home by a Toronto police officer on October 7, 2011, after calling 911 in distress, saying she had a knife and wanted to commit a crime. Michael Eligon was shot and killed by a Toronto police officer on February 3, 2012 after leaving Toronto East General Hospital in distress with a pair of scissors. Thanks to Paisley Rae for help with the transcription.